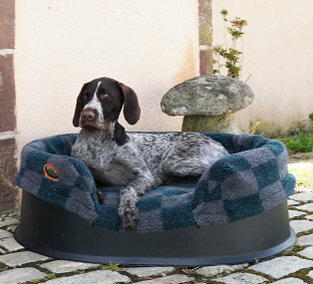 Small dog breeds and large dog breeds require different types of dog beds. Choosing the best dog bed for small breeds depends on several considerations about the dog, your circumstances and style. 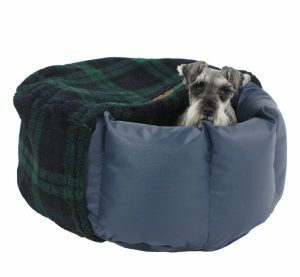 The ultimate dog bed for small breeds has to be the Mini Wolf Den from Tuffies. 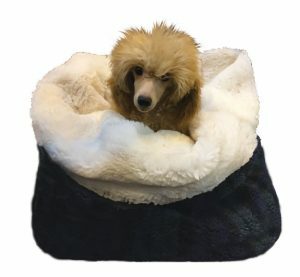 Made from the absolute softest, most luxurious faux fur, these little beds are irresistible and they satisfy everything a little dog needs. Dachshound in Mini Wolf Den. 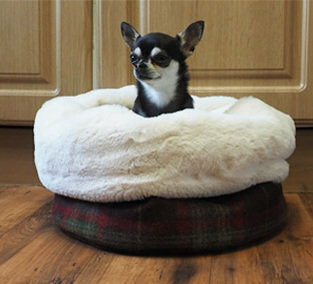 Tuffies Nest Beds are also great for small breeds. 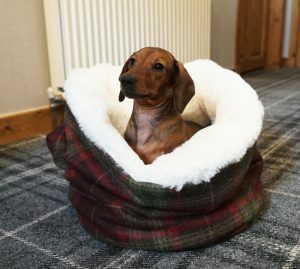 If you are getting a puppy, you should buy him a small dog bed that gives warmth and comfort as your new puppy will need all the help you can give him during the worrying time after he leaves his mum and litter mates. 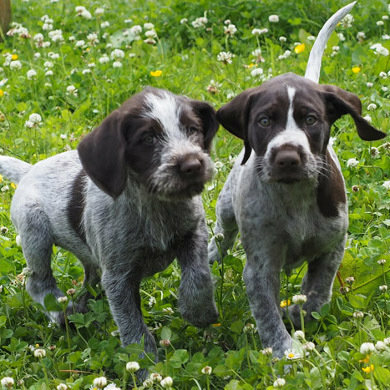 A deep, soft and comforting bed is essential at this time, but puppies grow very fast and you would be wasting money if you don’t buy with the growth of puppy in mind. To help with this, a simple trick is to get the correct size dog bed for the adult size and simply bolster it out with a nice blanket to fill the excess space so he feels snug while he is still a tiny puppy. If you can get a blanket that he had at home with his mum for bolstering the bed, you will give him the best chance of coping with the transition from mum to his new home. As he grows to his full size you can slowly give him more room by removing the blanket. 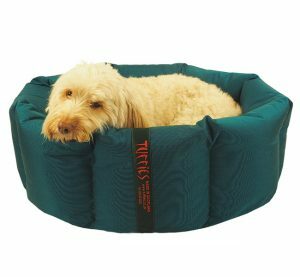 A great way of getting a dog bed for small breeds that can be used both as a small puppy bed and as a forever-bed is to get the Tuffies Puppy/Travel bed. 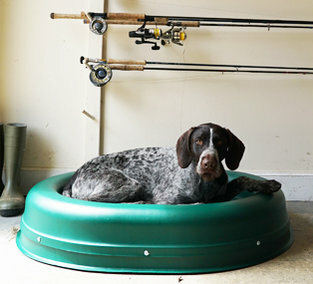 This ideal dog bed comes in puppy size when it is folded over as a thick, soft puppy bed, which can be secured nicely with poppers. Once puppy grows too big for this bed, you can undo the poppers and use the bed that is now twice the size as a convenient, light travel bed to have in the car. How big a bed you need for the adult dog of a small breed would depend on the habits of that particular breed. 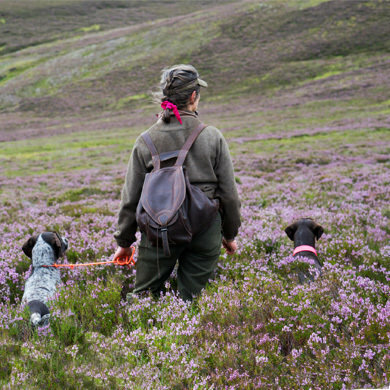 It would be worth asking the breeder if your type of breed tends to prefer sleeping curled up or lying flat out if you’ve not had that particular breed before. Always choose a bed that fits the sleeping position that is typical of your breed. Some small dogs are often very cold, while others are bred differently and seem to suffer in the heat. This depends on their metabolism as well as the thickness of their coat. While it is very important to keep a little shivery dog warm, it is also important to make sure that dogs who easily overheat can be comfortable in a bed that is not too hot as well. 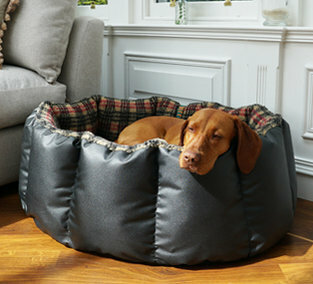 Dog beds for small breeds that tend to overheat should simply be a soft and supportive mattress dog bed without sides. As long as the bed does not sit in constant draught, the dog can be cool and comfortable. Remember that the situation can change from winter to summer, so you might need to ensure that you know about the temperature in this space on a windy, cold winter’s night. As a general rule, smaller dogs need warmer beds. Their surface to volume ratio is such that they lose heat quicker and usually would benefit from a nice, warm bed that they can sink in to, away from any draught or sneaking cold. A little dog like that can always climb out to cool down if necessary, but that is fine, he has a choice. One more little note regarding the dog’s coat. It might be a good idea to be realistic in your choice of colour when you pick a small dog bed. Dogs inevitably shed hairs and if you choose a black dog bed for a little white Jack Russell, you will notice the dog hairs far more than if you had a dog bed with a cream background and black paw prints. 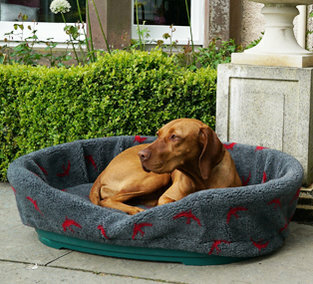 The Durasoft Nest bed shown below has a practical fleece inner for a white dog. 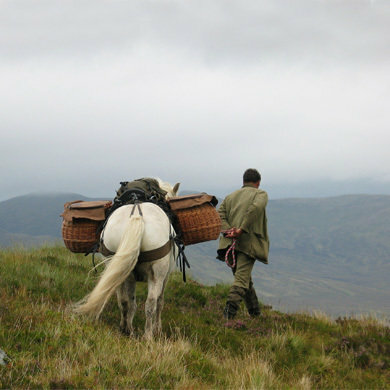 The Fleece Lined Nest is also loved by small breeds. 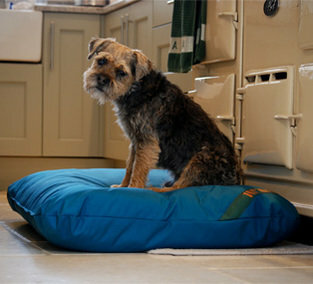 Dog Beds for Small Breeds that Suffer from Nervousness. For a dog, the dog bed is more than just a place to sleep! Dogs spend far more time on their beds than we humans do and they see their beds as their private territory, a place of peace and a place from where they can observe what is going on in the house. Some dogs, large or small, have a nervous streak in them and for them their dog bed can be an extremely important place to go for peace and tranquillity, not least if there is a lot of noise and children in the house. For a nervous small breed it is very easy to create a den for them, which appeals to their sense of security. 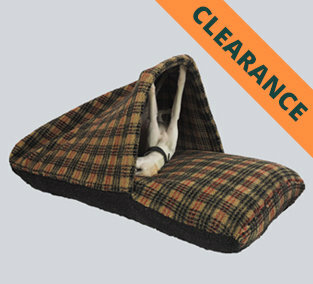 The Mini Wolf Den is designed to allow the dog to bury right in under for a feeling of security. Tiny Breeds like miniature poodles LOVE the Mini Wolf Den. The Tuffies nest bed with a Nest Sock over gives a perfect hide-away for a nervous dog and of course it keeps the heat in. To keep a little dog warm, the Tuffies Nest Sock is fantastic. 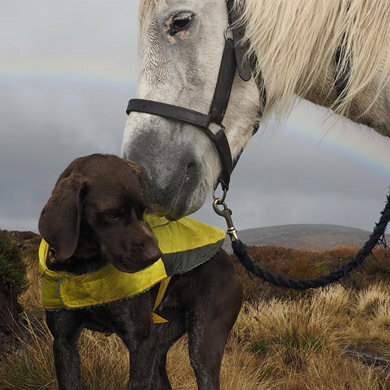 Most smaller breeds are really quite clean and, in general, they do not spend as much time outside as larger breeds, hence they don’t drag a lot of mud inside and onto their dog beds. However, some little dogs can be smelly and of course, some do enjoy the mud puddles just as much as larger breeds. There are some dogs that tend to smell a bit, for example the breeds with skin folds where a bit of a whiff can develop in the creases. In order to keep everything smelling nicely, making sure that cleaning is easy is very important. The Mini Wolf Den washes well at 30 degrees Celsius, but it does benefit from just a dry cleaning instead. 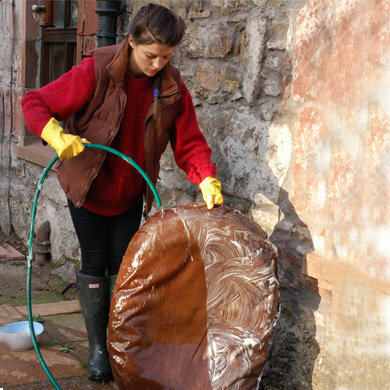 For dog beds for small breeds that need to be cleaned more often, a waterproof fabric with a removable, machine washable cover is absolutely ideal, for example a nest with a nest cover. 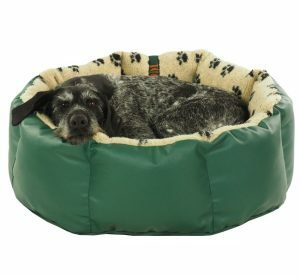 Choosing Dog Beds for Small Breeds Sharing with Larger Breeds. Of course many dog owners have several dogs of various sizes. The hilarious situation is often that the larger dog will squeeze himself in to the little dog’s bed leaving the big bed for the little dog! Not much you can do about this, but it is important that, even if the dogs seem to be happy to share their bedding, they should always have the choice of a bed each. And on the opposite side, it’s also common for small dogs to boss the bigger dog around as well. It is not unheard of that a Chihuahua demands the Labrador’s dog bed leaving the dog bed for small breeds to the 30 kilo dog, who simply cannot fit in to the Mini Wolf Den. Chihuahuas can be very cocky and bossy, so if it is a regular occurrence, you might have to give the Labrador an alternative place to sleep (two large dog beds available for them both). Looking after your dog during the winter means you have to try and think like a dog and go through a 24-hour period imagining where your dog is on a daily basis. 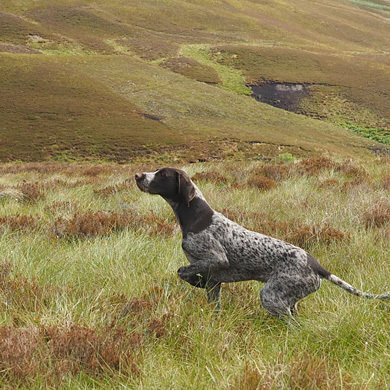 Most dogs spend many, many hours on their <a href="https:/..